Yes, I am the worst blogger in the history of the planet ;). What can I say, as much as I love to blog, life is busy! So after a two month hiatus I’m back…maybe. Since Trevor loved the Winter Toothpick Village we did in December, I wanted to create a similar activity for Valentine’s day. 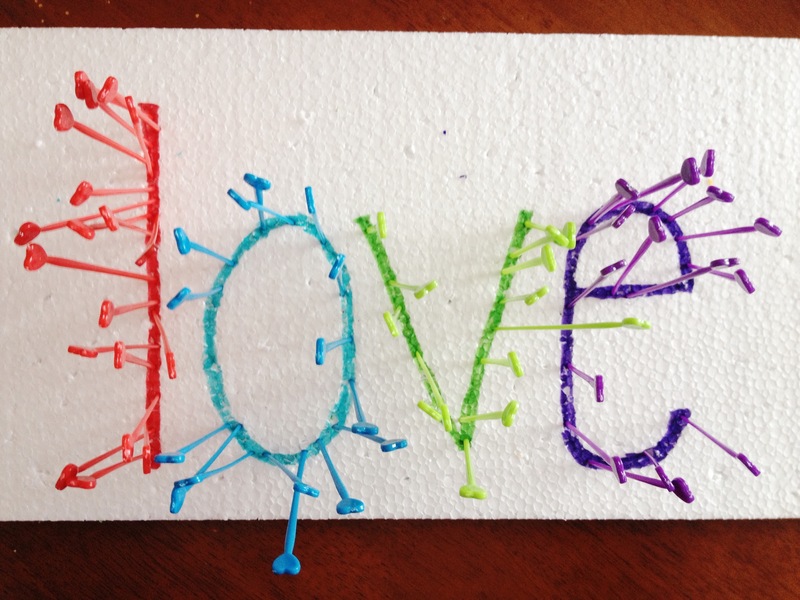 I picked up a pack of heart-shaped toothpicks at the Dollar Tree and wrote the word “love” on a piece of styrofoam I’d saved from a package. Each letter corresponded to a toothpick color so we could work on color matching too. I deliberately set the toothpicks out so that he’d have to cross midline to get the correct color. This is a skill he struggles with. Before we started I helped him trace the letters with his finger. 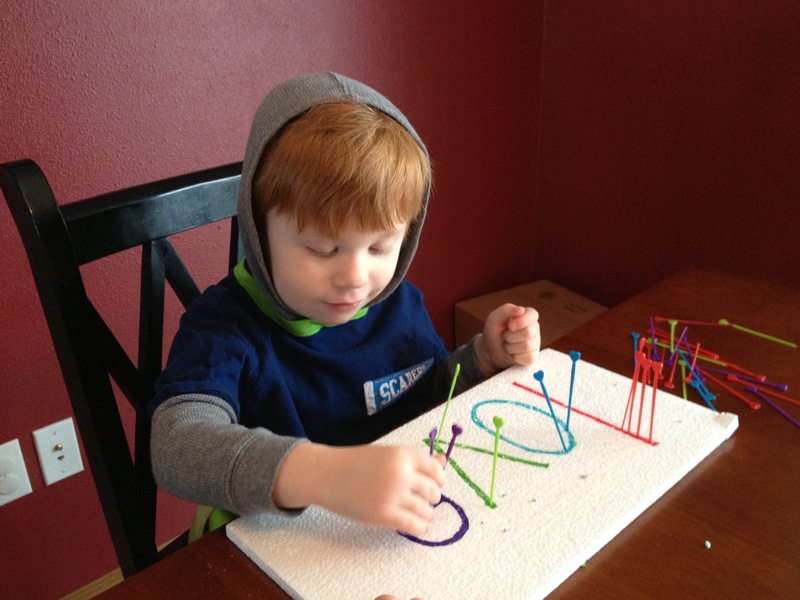 Just tracing letters in styrofoam is a great tactile learning activity! Trevor really enjoyed poking the toothpicks in the styrofoam. He also decided to let them have a “party” and just went about poking handfuls into the styrofoam in any order. His imagination is really blossoming! It looked pretty cool when it was finished too! 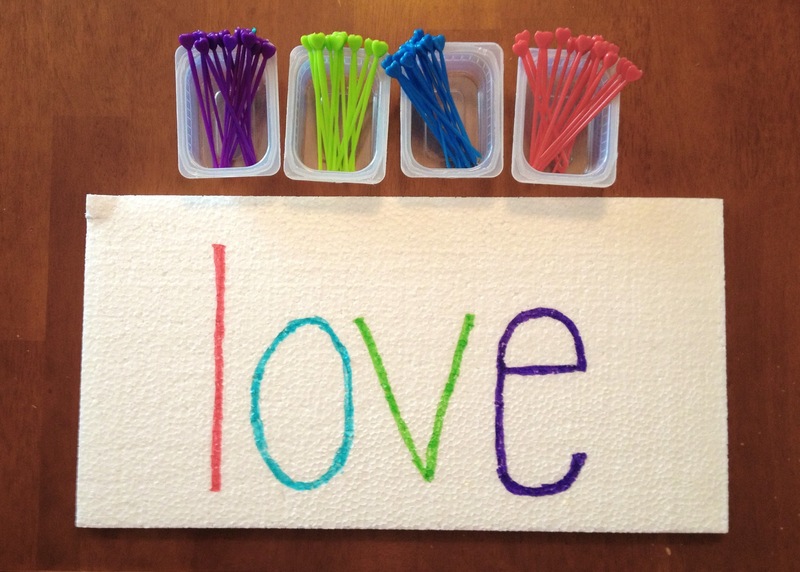 I hope your little ones enjoy this fine motor activity too! This is a great idea! I’ve been looking for some letter activities for my son and I think he’ll enjoy this. Thanks for sharing! How are things going for you as a momma of two? I still feel overwhelmed sometimes. What a great idea! I love the colored tooth-picks – getting in some color matching there too! Very thoughtful activity! I love that you planned it so he would cross mid-line. 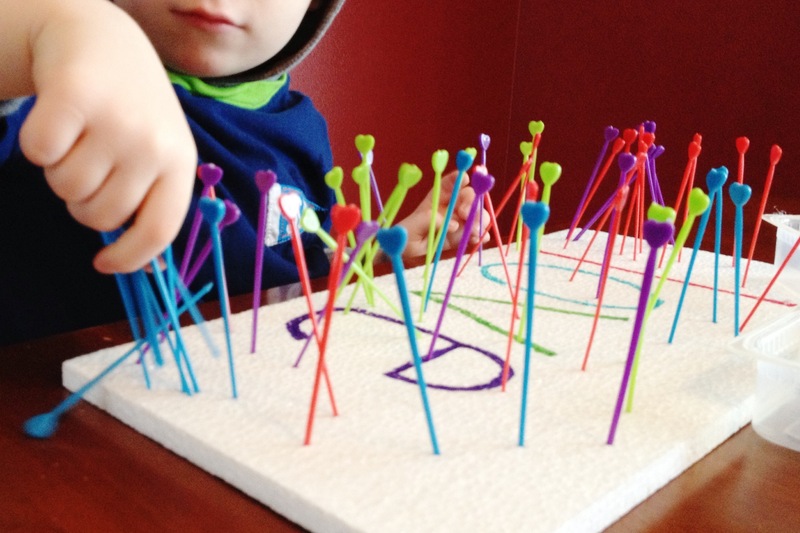 We did a very similar activity with my toddler, but we were lacking those super cool toothpicks!